Add unique detail to any bathroom, kitchen, hearth surround and cabana or accent wall application. Use with other complementary stone or ceramic field tiles for dramatic installations. Add color, personal charm and value to your home. Recommended for kitchen backsplashes, showers, accent walls, tub surrounds, and vanities. Recommend white polymer-modified thin set and either sanded or non-sanded grout for best installation results. With its smooth, unglazed surface and its slight shade variation, the Jeffrey Court's glass mosaic wall tile can be installed alongside stone or ceramic field tiles (sold separately) to create a coordinated look. Mesh-mounted Mosaics can be used as a whole sheet or cut to make affordable feature strips. Recommend white polymer-modified thin set and non-sanded grout for best installation results. Mosaics are excellent as stand-alone pieces or used with complementing stone, ceramic or glass field tiles. Blending products from multiple boxers will ensure a uniform look. Natural stones have substantial shade variations. Glass mosaics are not recommended for floor applications as they are susceptible to scratching. Mosaics containing copper or metal may not be used where there is consistent moisture in wet areas or submerged. This included, but is not limited to: showers, steam showers, fountains and pools. The Merola Tile Igloo Convex Subway Glacier White 11-5/8-inch x 11-7/8-inch x 12 mm Glass Mosaic Tile recreates the wonder of frozen stone. This convex glass tile features a backing that replicates natural white stone. The glass has a multi-dimensional textured surface, giving off the look of fresh ice. This impervious mosaic is mesh-mounted for easy installation. Grout color can change the appearance of this glass tile, so make sure you pre-test your grout selection to be sure you are satisfied. 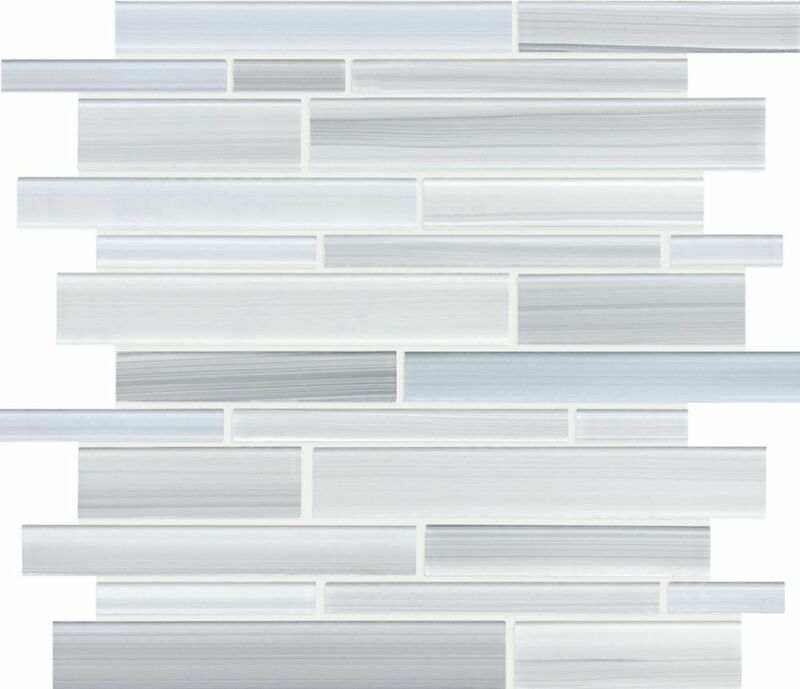 Strip Glass Mosaic Tile in Tribeca Glacier is rated 3.5 out of 5 by 2. Rated 5 out of 5 by Karen from Awesome Tile I researched tile online then went to Home Depot to see this one in person. I got a rep to get me one square so I could take it home and see it in the natural light. It looked great so I purchased enough to do my backsplash. I had someone do it for me but I bought the grout and made sure it had NO sand in it. I think it looks great and has very subtle colours. So that I didn't have to cut a lot of tiles I put a border of 6" tiles along the bottom and under the cabinets mdf border. I also had Corian countertops here and on my island. Rated 2 out of 5 by Mo24 from Not as impressed as I wanted to be Overall not bad to install, the usual few pieces needed to be told where to go which you can adjust on install and I really enjoyed the colours. It looked wonderful when installed and then I grouted... I used a sanded grout as this had 1/8" grout lines and it was a centerpiece with different tiles in a shower surround. After grouting and cleaning you couldn't see much until I wiped the haze and suddenly there were a ton of scratches in the tiles! Really really unimpressed that my brand new just installed tile looked suddenly like it had been put through the ringer with years of abuse. It was really upsetting to realize my beautiful new shower surround was ruined. I am at a loss for what to do because I want to replace them as they look terrible but the amount of work and set back is unacceptable. You need a grout that has no sand or you will get scratches. I used Fusion Pro single component Grout. It doesn't require sealing. Colour I used is Bright White. Is this price per unit or per box? How many would be in a box?